Azerbaijan in the South Caucasus Mountains. The Atabegs of Azerbaijan rose from the ashes of the vast Seljuk Empire in the beginning of the twelfth century. The atabeg (literally father lord in Turkish) was the title of guardians appointed for minor princes of the Seljukid line who were nominally placed in charge of provincial garrisons. Atabegs, usually Turkic slave-officers, were officially tutors and vice-regents to their princes, but in the political circumstances of the time, they were the actual rulers. In 1136, Sultan Masud od Hamadan (1134–1152) appointed Shams ad-Din Eldegiz (c. 1135/36-1175) to be an atabeg of Arslan-shah, his step-son and juvenile successor, transferring Azerbaijan to his possession as iqta, land in lieu of payment. Eldegiz chose Barda as his residence, from where he set about extending his power, founding the Atabeg state in what is now Azerbaijan. Under the Atabegs, Azerbaijan became a significant cultural center of the Turkic people. The Atabek State fell in 1225 when it was added to the Great Mongol Empire created by Genghis Khan. Apart from a brief period immediately after the end of imperial Russia, Azerbaijan was in the main part of lager entities from the end of the Atabeg State until the founding of the Republic of Azerbaijan in 1991. It was contested territory between the Iranian and Russian spaces, with the former dominating the South and the latter the North. As a consequence of its history, Azerbaijani culture blends influences, representing a bridge between civilizational spheres. The aim of creating a stable state, where people can enjoy liberty and live freely, which appears to have motivated the Atabeg rulers, was arguably adopted by the Azerbaijan people as a national goal. Although a majority Muslim country, in 1918-1920 when Azerbaijan was briefly independent and in 1991, when it became a sovereign state, it chose a secular constitution. Other faith traditions alongside Islam. A nation that has often been the prize over which others have waged war finds internal stability all the more attractive. The area known as Azerbaijan, partly in East Europe, partly in Asia was conquered by Alexander the Great. Under the Sassanids Azerbaijan was an autonomous kingdom. In the seventh century, the Umayyads conquered Azerbaijan, which was subsequently part of the Abbasid caliphate. It then fell to the Ghaznavids followed by the Seljuks, who were nominally loyal to the Abbasid caliph. Towards the end of the Seljuk empire, the Atabegs were de facto rulers. Originally, the Atabeg was the guardian and regent for a ruler not old enough to govern, in this instance Arslan-shah. The Slejuks appointed young princes (maliks) as governors of a province, with the atabeg exercising responsibility for governance and administration. Increasingly, the Atageb became "the actual governor of the province, and the malik was only sent with him as a matter of form." Shams ad-Din Ildeniz was a capable general and administrator and theoretically consolidating and extending the power of his prince, he subdued a spacious territory between the Caucasus and the Persian Gulf. The word “Azam” (Azam stands for Great) was added to his title, a tile which all of the State’s subsequent rulers would use. His strongest foe was Georgia, whose army was strengthened by 40,000 Kipchak Turkic warriors. In 1138 the Georgian king Demetre I, attacked the ancient city of Ganja. While leaving the city his troops carried off the well-known iron gate of Ganja as their trophy, which is now on display in the city of Gori. From 1161 onwards, the Georgians made plundering raids on Ani, Dvin, Ganja, Nakhchivan and other regions controlled by the Atabeg. Eldeniz formed a union with other Seljukids in the beginning of 1160s to fight against the Georgians, and in 1163 the allies inflicted a defeat on king George III of Georgia. In response to this defeat, the czar of Georgia occupied Ganja in 1165. 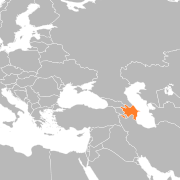 Georgians took several Azerbaijani cities and reached such faraway cities as Nakhchivan and Beylakan. Usually, the Georgians demanded tribute then left once this had been paid. In 1173, Atabeg Shams ad-Din Ildeniz began a major campaign against Georgia but was defeated. His troops retreated. Shams ad-Din Ildeniz died in 1174 in Nakhchivan. He and his wife were buried in a religious school (madrasa) they had built in Hamadan, the Seljuk capital. His name appears on at least one building from this period, described as "splendid example of the early use of colored tile." After Shams ad-Din Eldeniz death, the Seljuk prince, Arslan Shah, tried to assert his own authority and replace the new Atabeg, Shams ad-Din's son, Grand Atabeg Mohammed Jahan Pahlavan (1174-1186) but failed, and was poisoned to death. Pahlavan transferred his capital from Nakhchivan to Hamadan in western Iran, and made his younger brother, Qizil Arslan Othman (1186-1191), the ruler of Azerbaijan. In 1174, Qizil Arslan captured Tabriz, which subsequently became his capital. Jahan Pahlavan suppressed all rebellious emirs and appointed faithful mamluks (slaves) to key positions. He awarded each of them a region or town as iqta. The Twelve years of Pahlavan's rule are considered the most peaceful period of the State’s existence. Under his reign the central power was strengthened and no foreign enemy invaded Atabeg territory. Friendly relations with Khorezmshakhs, the rulers of Central Asia, were forged. All this had positive influence on the development of science, handicraft, trade, and arts. After Pahlavan’s death his brother Qizil Arslan (1186-1191) ascended the throne. He waged a successful struggle against the Seljuk rulers. However, the authority of the Atabeg was also weakening as the regional mamluks strengthened their own power in their areas. Shirvanshakh Akhsitan, who used to be Atabeks’ vassal, decided to benefit from the weakening of the Atabek’s power and invaded his territories in 1186. He was defeated, however and his troops had to flee pursued by Atabeg’s army. They reached Baku. Qizil Arslan occupied all the land of Shirvan lying between Shamakha and Derbent and in 1191 overthrew Togrul III, the last Seljuk ruler of Hamadan. Then, after obtaining the Abbasid caliph's permission, Qizil Arslan was proclaimed as Sultan only to be assassinated later the same year. Power was divided among his three sons: Abu Bakr, Qutluq Inandj and Amir Amiran. Abu Bakr governed Azerbaijan and Arran; his brothers ruled Khorasan and several neighboring regions. Soon, these three successors began to fight each other for the throne. Abu Bakr won but in the process the State’s defense capability was compromised. Khorezmshakhs’ and Georgians’ non-stopping forays aggravated the situation, speeding up its decay. Abu Bakr was succeeded by Atabek Uzbek (1210-1225) against whose rule Hassan Djalal Mikhranid (1215-1262) began separatist activities. This further shook the already weakened State, which invited another invasion from Georgia, this time from the troops of the czarina Tamara, which occupied several Azerbaijani towns before returning to Georgia. Uzbek's vizier, Abu’l-Qāsem Hārūn "was a well-known patron of learning in Tabrīz." Uzbek, who had married a daughter of Sultan Togrul, was faced by the Mongol invaders, initially buying them off. He finally fled and died as the Mongols swept through and annexed Azerbaijan. From 1225 the Atabeg state was incorporated into the Great Mongol Empire created by Genghis Khan. After the decline of the Mongol empire, the region was subject to Safavid rule and the population, previously Sunni became majority Shi'a. The first state to use the name "Azerbaijan" was established by Shah Ismail I, founder of Safavids who later extended his rule throughout Persia. By the late eighteenth century, Azerbaijan had splintered into smaller states, each with their own khan. Russia had moved into the region in the early eighteenth century. After a brief period of independence after the collapse of imperial Russia, Azerbaijan became a Soviet republic until 1991, when the sovereign Republic of Azerbaijan was born. Literature flourished in the Atabeg state and was patronized by the rulers. Among poets of distinction were Khanum Mehseti Ganjavi, Khagani Shirvani and Nizami Ganjavi. Mehseti is renowned for refusing to wear a veil; Nizami's famous works include an ode to Alexander the Great and the work of epic poetry, the Storehouse of Mysteries, which contains moral and religious maxims. He is remembered as one of the earliest romantic poets in Persian. The themes of toleration and benevolence characterize his work, which also explores the inner struggle between our best and worst selves. He dedicated several poems to the Atabegs but preferred to maintain artistic autonomy by declining royal patronage. The Silk Road passed through the Atabeg State, making trade in handicrafts a major source of revenue. The Atabeg state, from 1136 until 1225, represents a brief but significant period of stability, cultural flowering and of relative independence in the history of Azerbaijan. The geo-politics of Azerbaijan was for centuries one of life on a frontier between the Iranian and Russian spaces and between the European and Asian continents. "Rarely," says King, "has Azerbaijan had the peace and stability needed to build a strong independent state." "Instead," he comments, "through most of its history, it has been a province ruled by Persia, Russia or some other powerful empire." The last ruler was also confronted by the expansionist polity of what became the largest contiguous imperial territory in history. The Atabegs were inevitably faced by invasion and spent a lot of time defending their territory and sometimes expanding this as well. Yet they appear to have wanted to establish a viable state on the edge of competing zones where human life could flourish. All rulers of the dynasty patronized learning. Azerbaijani culture blends influences, representing a bridge between civilizational spheres. Azerbaijanis have made valuable contributions within the Turkish, Persian and Russian spaces, since they can easily move across these borders and within these cultural domains. Although under the Safavids, the majority of the population became Shi'a, Sunni, Jews, and Zoroastrians (Zoroaster was born in what is now Azerbaijan) live in harmony. The aim of creating a stable state, where people can enjoy liberty and live freely, which appears to have motivated the Atabeg rulers, was perhaps adopted by the Azerbaijan people as a national goal. In 1918-1920, when Azerbaijan was briefly independent and in 1991, it chose a secular constitution that guarantees freedom of religion. A nation that has often been the prize over which others have waged war may find internal stability all the more attractive. ↑ Fisher, et al., The Cambridge history of Iran (Cambridge, UK: Cambridge University Press, 1968, ISBN 9780521069359), 240. ↑ 2.0 2.1 K.A. Luther, ATĀBAKĀN-E ĀḎARBĀYJĀN, Encyclopaedia Iranica (New York, NY: Columbia University). Retrieved January 24, 2009. ↑ Antoine Constant, L' Azerbaïdjan (Méridiens. Paris, FR: Karthala, 2002, ISBN 9782845861442), 96. ↑ M. T. Houtsma, E.J. Brill's First Encyclopaedia of Islam, 1913-1936 (Leiden, NL: E.J. Brill, 1987, ISBN 9789004082656), 1053. ↑ Herbert Mason, Niẓāmī Ganjavī, and Jalāl al-Dīn Rūmī, A Legend of Alexander ; and, The Merchant and the Parrot: Dramatic Poems (Notre Dame, IN: University of Notre Dame Press, ISBN 9780268012816). ↑ Niẓāmī Ganjavī, and Gholam Hossein Darab Khan, Makhzanol Asrār = The Treasury of Mysteries (London, UK: A. Probsthain, 1945). ↑ David C. King, Azerbaijan (New York, NY: Marshall Cavendish Benchmark, 2006, ISBN 9780761420118), 17. Bosworth, Clifford Edmund. The New Islamic Dynasties: a chronological and genealogical manual. New Edinburgh Islamic surveys. Edinburgh, UK: Edinburgh University Press, 2004. ISBN 9780748621378. Constant, Antoine. L' Azerbaïdjan. Méridiens. Paris, FR: Karthala, 2002. ISBN 9782845861442. Fisher, W.B., Ilya Gershevitch, Ehsan Yarshater, R.N. Frye, J.A. Boyle, Peter Jackson, Laurence Lockhart, Peter Avery, Gavin Hambly, and Charles Melville. The Cambridge history of Iran. Cambridge, UK: Cambridge University Press, 1968. ISBN 9780521069359. Hodgson, Marshall G.S. The Venture of Islam: Conscience and History in a World Civilization. Chicago, IL: University of Chicago Press, 1974. ISBN 9780226346779. Houtsma, M. T. E.J. Brill's First Encyclopaedia of Islam, 1913-1936. Leiden, NL: E.J. Brill, 1987. ISBN 9789004082656. Kafesoğlu, Ibrahim. A Short History of Turkish-Islamic States (Excluding the Ottoman State). Ankara, TR: Turkish Historical Society Printing House, 1994. ISBN 9789751605719. King, David C. Azerbaijan. Cultures of the world. New York, NY: Marshall Cavendish Benchmark, 2006. ISBN 9780761420118. Leeuw, Charles van der. Azerbaijan: A Quest for Identity, a Short History. New York, NY: St. Martin's Press, 2000. ISBN 9780312219031. Minorsky, Vladimir. The Turks, Iran and the Caucasus in the Middle Ages. London, UK: Variorum Reprints, 1978. ISBN 9780860780281. History of "Atabegs of Azerbaijan"
This page was last modified on 23 October 2014, at 17:17.